Tough and reliable, the Maglite flashlight stands out in a product category filled with unreliable competitors. Maglite flashlights endure, whereas so many others fail surprisingly quickly. Machined aluminum body with machined textured surface provides good heft and secure purchase. Powered by standard batteries; no need to discard the whole flashlight when the power source fails. Store these flashlights in bedrooms and glove compartments for emergencies. Aluminum flashlights of all shapes, prices and quality levels populate the retail jungle. But just because a flashlight is aluminum with a knurled body and perhaps a belt clip or velcro strap does not assure it will endure in the field. Cashier stands from coast to coast feature so-called "tactical" flashlights made to a price point. Buyer beware. Certainly other flashlight brands are reliable, but Maglite is an enduring brand offering a limited lifetime warranty. Here, the strong brand reputation is itself invaluable. 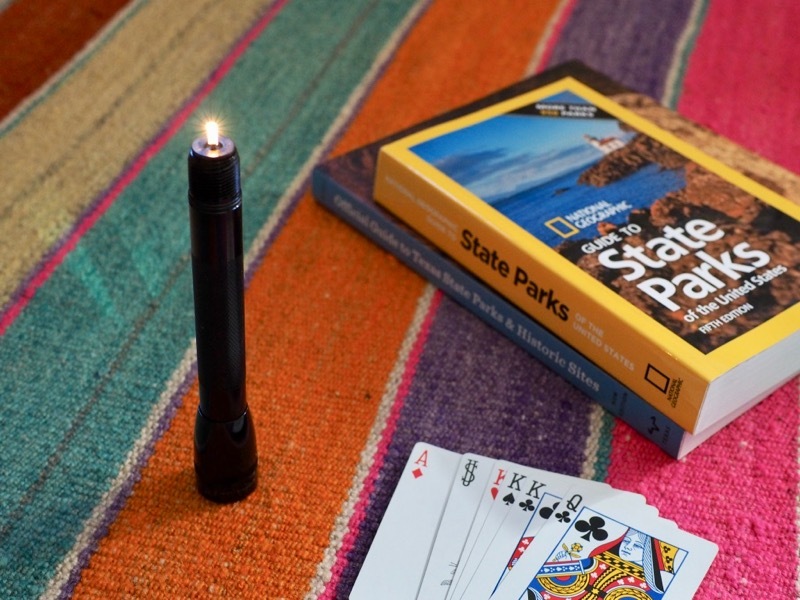 Maglite Mini may be configured as a small torch; great for campsite card games. Maglite flashlights work well and endure, which is not typical for many flashlights on the market. Mostly as gifts, a small platoon of other flashlight types and brands have come and gone in my arsenal of personal hand-held lighting, but only the Maglites have endured. In recent years the flashlight market has undergone two swells of technological change. Maglite embraced one of these, successfully, and eschewed the other, favorably. Maglite's ongoing use of standard-size replaceable batteries is a welcome contrast to the industry's tendency toward proprietary rechargeable batteries. Rechargeable flashlights often suffer two major drawbacks. One, they often require a proprietary power cord, something that is easy to lose or misplace. Second, when the batteries reach the end of their useful lives and cannot be recharged, replacing them becomes a major inconvenience. Maglite flashlights do not need a proprietary charging cord. And, in a pinch, you can buy new batteries just about anywhere. Terrific rechargeables in standard sizes are available. It would be hard to find a person that would not profit from receiving a Maglite flashlight. They are so welcome in bedrooms and glove compartments for emergencies that even the person who has everything—even a passel of Maglites—would likely joyfully receive a(nother) Maglite as a gift. Mini Maglites also make great gift considerations for anyone that enjoys camping. The ability to configure them into small campsite torches for playing cards and reading campfire stories adds to their versatility. Maglite flashlights are reliable but they are not foolproof. Like all important battery-powered appliances, the batteries should be changed or charged regularly. This practice is especially important in these flashlights. I had a neglected Maglite in a seldom-used location that sat out of sight for several years. The batteries failed and then swelled, and there was no removing them once that occurred. This very event led to my building a battery-replacement schedule for my flashlights (and my whole-house water leak shutoff detectors).